Supermarket Distributors of America has been in the wholesale health & beauty distribution business for over fifty years servicing Supermarkets, Hotels, C Stores, Grocery Stores, Convenience store supplies, Drug stores, Variety stores and many College & University Bookstores. Supermarket Distributors of America is a wholesale distributor and supplier of personal care supplies and personal care products. We carry a full line of Guest Supplies, Hotel Amenities and Hospitality Supplies. Bar Soaps and Body Wash, Hand Sanitizers, Liquid Soaps, Towelettes, Antibacterial, Hand Lotions and Face Creams, Lens Cleaners, Personal Care Products, Shaving Supplies, Deodorants, After Shave, Headache and Pain, First Aid Kits and Supplies, Feminine Care, Razors, Razor Blades, OTC Medicines, Sewing Kits, Combs, Brushes, HairSpray, Shaving Creams and Gels, Nail Care, Shower Caps, Powder, Baby Needs, Baby Oil, Petroleum Jelly. Click Here To View Our Entire Product Catalog. Princeton, Colgate, Texas A&M, Central Michigan, U. of Wisconsin, S. Virginia, and many SUNY & CUNY Universities are supplied by us just to name a few. Stop N Shop, Foodtown, Piggly- Wiggly, Hy-Vee, Ctown, Met Foods, Pioneer, IGA and Associated supermarkets are also using our services. We have the experience and expertise necessary to respond quickly to any concerns or needs of our customers. We provide every campus bookstore with an HBC - HBA, Ethnic, Housewares, and General merchandise setup that is consistent and fully stocked with only the fastest movers in each category. The product mix is always geared toward the college students. 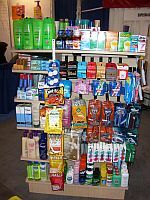 Many University and College Stores Convenience store suppliers ask for a wholesaler merchandising display to feature all of the products in a one-stop shopping experience. Our solution is a four-sided premium oak-finished, wood display that is attractive in any location of the campus stores, and can hold up to $6,000 of assorted merchandise. 25070 JERGENS LOT 10ozORIGINAL#10993 019100110151 3.53 FACE CREAMS/HAND & BODY LOT. 25391 LUBRIDERM 3ozNORMAL/DRY#48844 052800488441 2.11 FACE CREAMS/HAND & BODY LOT. 25076 NEUT HAND CR 2ozREGULAR#01290 070501012901 4.40 FACE CREAMS/HAND & BODY LOT. 25171 ST.IVES SCRUB APRICOT 6z#10360 077043105627 3.50 FACE CREAMS/HAND & BODY LOT. 25475 VIC LOT 10ozTOTAL#07700/ 305213077000 2.92 FACE CREAMS/HAND & BODY LOT. When ordering a merchandising display, we can planogram the products so the setup time is minimized and the selection is tailored to each bookstores needs. Some stores require more of one category than another, so we adjust their planogram to fit them! Every customer is treated special and we pride ourselves in satisfying all the campus store’s goals for a Health & Beauty Care / Houswares section that is unique to them. 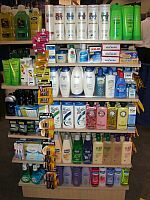 Every display has approximately 300 sku’s of the fastest moving general merchandise - health & beauty care products and Housewares Manufactures across all the categories . We also provide shelf labels for all the important product information and retail pricing for every product. These labels are not only printed for the initial setup, but on all orders, in case any labels are damaged, or in case of any price changes. All stores provide us with the gross profit margin desired, so our technicians can program a retail zone for all the selected products for the individual store. We provide a catalog every month, which lists all our products, with code numbers and minimum purchase requirements, so any store manager can place orders easily. The catalog lists all products in category order and alphabetic order too. Orders may be placed by phone, fax, or email. All orders placed by 12pm, are shipped the same day via UPS or LTL delivery. Prepaid freight is included with all orders over $750. We also understand that products can get damaged in the process of operating a store. We offer a .5% Allowance that may be deducted from each invoice to cover these incidental damages. All the manufacturer policies in the past 15 years have changed, and 95% of all manufacturers’ do not give us any credit for Damages or returns. If your store doesn’t require a display, we would be very happy to Provide all your needs, to fill your existing shelves. If you have any questions, please call us at 631-273-3900. I hope that we can form a mutually beneficial relationship in the near future. Thank you for your consideration and time. SDA Buys Directly From Every Manufacturer Guaranteeing You The Lowest Prices And Freshest Merchandise.